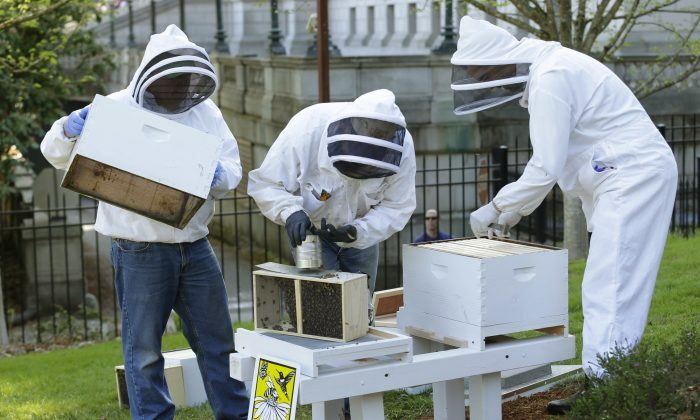 OTTAWA—A group of international scientists met in the national capital on Sept. 19 to try to convince parliamentarians there is no longer any doubt that common agricultural pesticides are proving toxic to ordinary honey bees. In fact, says Jean-Marc Bonmatin of the French National Centre for Scientific Research, neonicotinoid pesticides kill a lot more than just bees, posing a deadly risk to frogs, common birds, fish, and earthworms. They released an update to the report and met with MPs in Ottawa to make the case for an immediate ban on the pesticides. Neonicotinoids, also known as neonics, are nicotine-based pesticides commonly used by farmers to help keep everything from field crops to fruit orchards free of pests like aphids, spider mites, and stink bugs. Bees, Bonmatin, said, were only the most “visible part of the problem” because beekeeping is a big business—and without bees, billions of dollars of farm crops would go unpollinated. Wild bees, invertebrates like earthworms, and amphibians like frogs have also shown signs of neonics poisoning, as have birds, which eat neonics-coated seeds. Research suggest neonics can affect reproduction, growth, and movement for these species, as well as make them more susceptible to disease. Lisa Gue, a senior researcher with the David Suzuki Foundation which is involved in the release of the updated report, said Canada has to catch up to Europe which banned the use of neonics in crops which attract bees in 2013. France is currently phasing in a complete ban on all agricultural uses of neonics, with the full ban set to take effect next year. Gue said even if Health Canada decides next year to ban imidacloprid, that phase-in isn’t scheduled to even start until 2021. “I’m not sure if we’re at the point of the ban yet, but I think one of the things is if there is real strong evidence that the pesticide and the way we’re using it is causing harm, we’ll have to deal with it,” he said.